I have been quiet here in blogland this last year. One of the main reasons is that most of my online time is spent on an iPad ... which is not at all conducive to posting here. It's been easier for me to post a quick picture with a brief message on Facebook when a project was finished. Also, I haven't been all that productive in my studio(s). My energy has been a bit diminished since surgery a year ago August and what I do have has been directed to time and activities with family and friends and keeping up with two households. 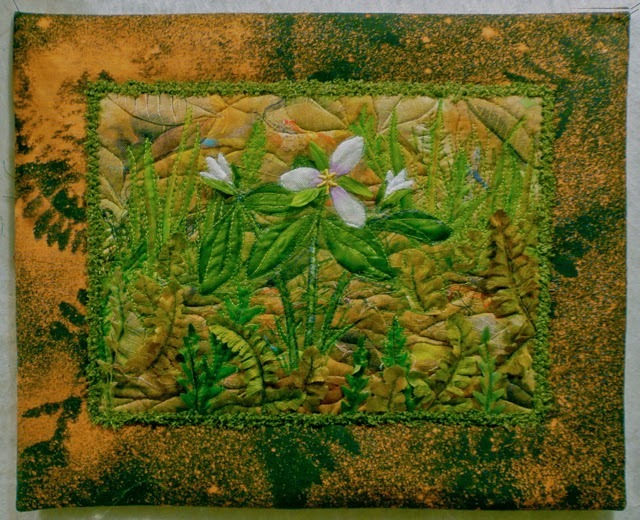 It won 3rd place in the Art Quilt category of the 2013 Smoky Mountain Guild Quilt show . To see the beginnings of this piece as well as others that present variations of my favorite view in the Smokies go here. It is for sale at the Cliff Dweller's Gallery in Gatlinberg, Tennessee. The making of it can be read in the posts of February last year. 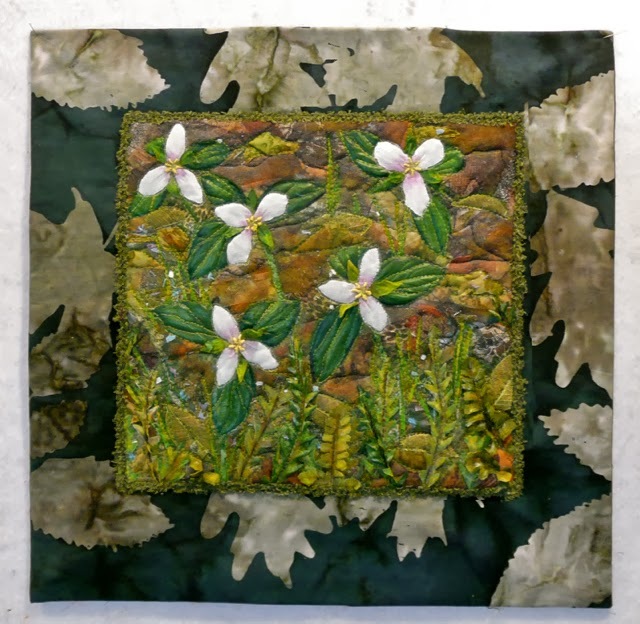 This, too, was an award winning quilt in the SMG Quilt Show last spring. 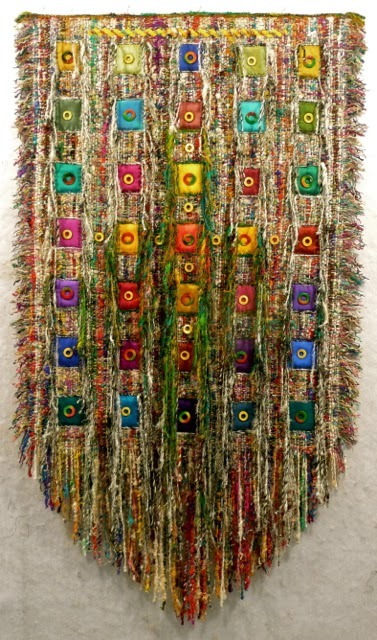 It is hanging in its new home in Memphis, Tennessee. 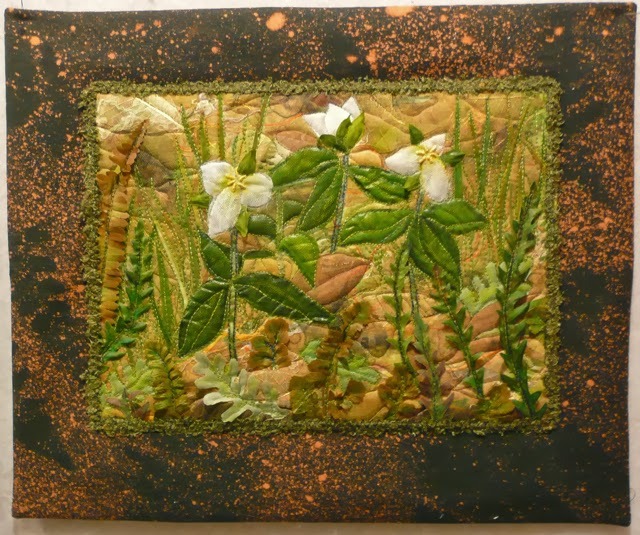 This is the first of the wildflower series wall quilts. It found a home in northern Indiana. The two above are for sale at the Cliffdwellers Gallery up in the mountains. The two above are the ones that got pieces of real birch bark along with leaf skeletons included. They are available for purchase at Good Goods Gallery in Saugatuck, Michigan. 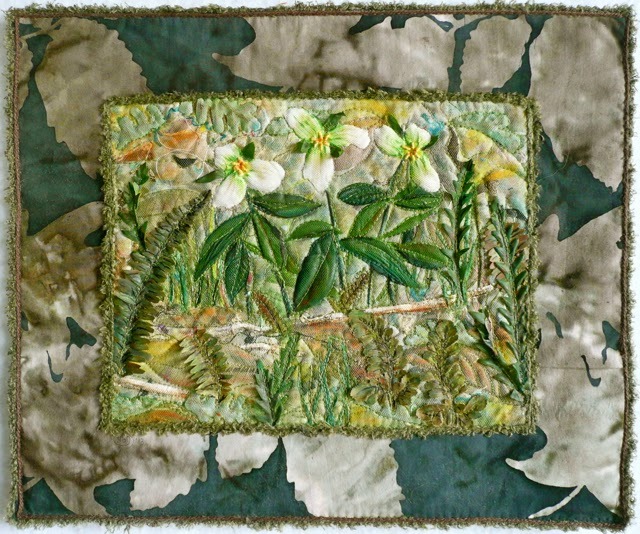 The making of all the wild flower pieces can be read about here. 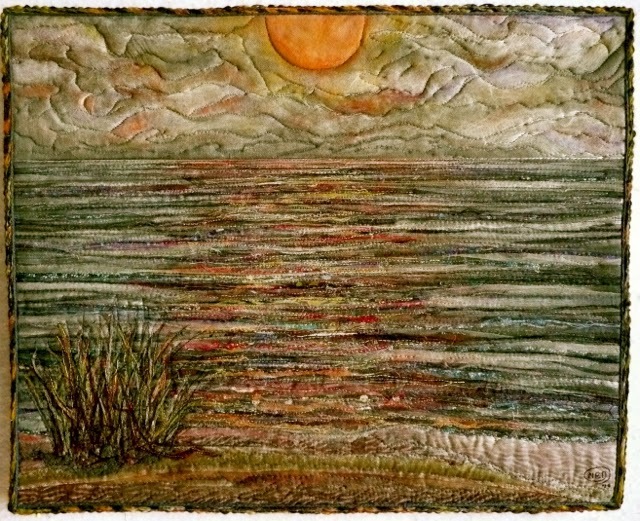 This is part of the 100 lake series. I'm sure my goal of a hundred has been reached... I've lost count. However, I'm not finished with making lake pieces. There are definitely more moon set ones in my future. This one was sold to a Michigander. There was quite a bit of creative time spent this fall playing with glass. I'll post about that big project in the near future. I'm looking forward to being more productive this next year. I've already got a start on that by participating in an online group endeavor. More about that in my next post. PS: Add the cuddle quilt "Boxes of Color" that was written about in the last post) to this list of accomplishments for 2013. So happy to see this post. I was worried, and missed seeing your work. I am so inspired by what you create. I know what you mean about tablets. I am typing on one right now. Lovely to see your work again Nellie. It took me months to recover from quite simple surgery and although you have no energy, you certainly haven't been idle! 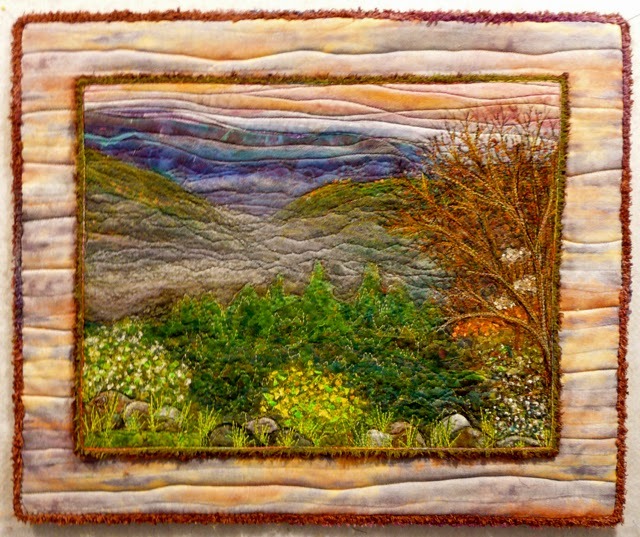 All these pieces are beautiful but I especially like Smoky Mountain Sunrise and Trillium No.3. I hope your energy returns in 2014 and I look forward to seeing more of your wonderful work. Always good to see your blog posts! Working with glass!? Cant wait to see what, where, etc! I've missed seeing your work, too, Nellie. These are wonderful. In the worst of times and the best of times, your work never ceases to amaze me. You are an inspiration in more ways than one! Great to see you back on the blog. I love you new trillium series. Happy to see your post . . . your work is marvelous!! Sending good thoughts your way. Glad to see your post and to have a review of the work you did over the past year, along with looking after yourself. You've obviously been very productive, despite what's been going on. Good for you, and here's to great things in 2014! Nellie it is so nice to see you back. 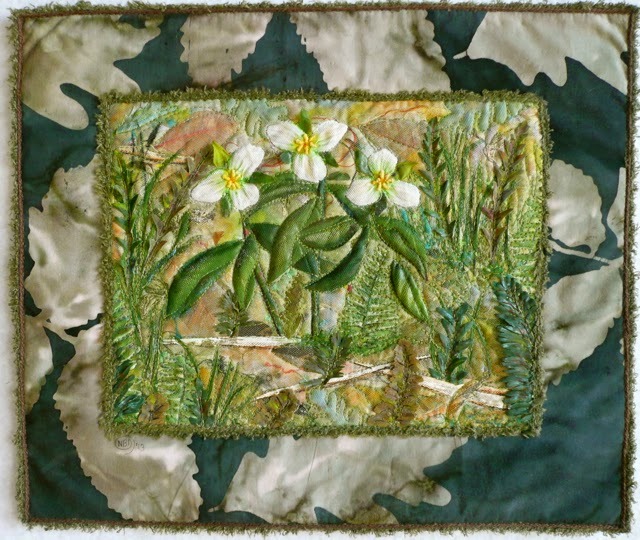 I love all of your trilliums and despite this Arctic vortex that is giving us such great misery, your trilliums remind me that better days are on the way! Each one is special, distinctive, and beautiful...just like you dear friend. Great to hear you are coming back in 2014…..Looking forward to seeing more of your work and interested in what you did with glass!!!! I am so glad so see what you have been up to- all lovely. I hope you are doing well, I'm looking forward to seeing what you do in 2014. Beautiful works and it will be sooo nice to have you back. I am always fond of the sunset pieces. It is so GOOD to see you blogging again...you and your beautiful works have been sorely missed, I knew you had health issues and I sincerely hope you are feeling much better. 2013 was a year I was glad to see consigned to history. I so often pull out your Lake Postcard and admire it. I thought of you and your hubby this week as there were "celebrations in Parkes (NSW) commemorating Elvis.